With all eyes on Sunday's Bavaria election, moments ago the first exit polls showed a historic collapse for the ruling CSU party, which has ruled Bavaria continuously since 1957, and which saw its share of the vote collapse from 47.7% in the 2013 election to just 35.5%, losing its absolute majority and suffering its worst result since 1950, as voters defected in their droves to the Greens and the far-right Alternative for Germany. German newspaper Welt called the election "the most painful election defeat of the past 50 years for the CSU". 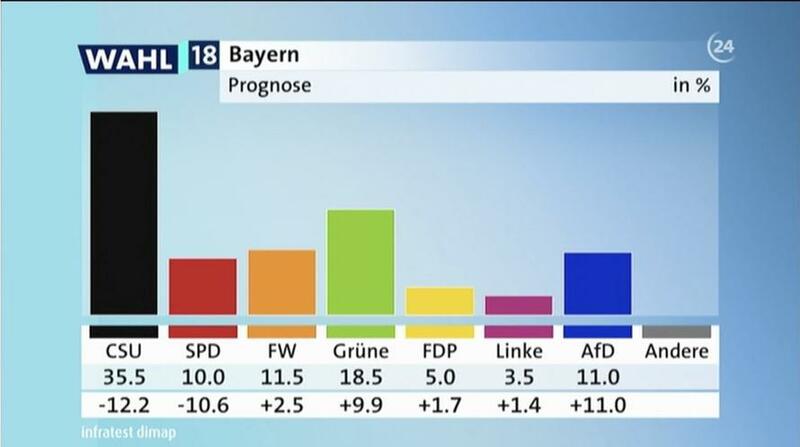 As predicted in the polls, the CSU experienced a "historic debacle" in the Bavarian state elections, according to Welt. 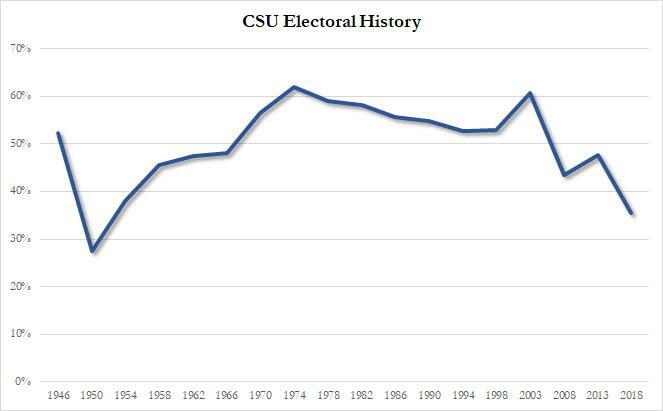 The CSU was followed by the Greens which soared in the election, more than doubling to 18.5% from 8.6% in 2013, the Free Voters also rose to 11% from 9.0%, in 2013. Meanwhile, the nationalist AfD are expecting to enter Bavaria's parliament for the first time ever with 11% of the vote, and as such are setting up for their post-election party. Party leader Alice Weidel already is having the first beer in the small community of Mamming in Lower Bavaria. The latest collapse of Germany's establishment parties highlights the shaky ground the grand coalition in Berlin is now resting on as all three parties in the alliance, Merkel’s Christian Democratic Union, the CSU and the SPD, are haemorrhaging support. Some are now questioning whether the coalition, already frayed by personal rivalries and near constant bickering over policy, can survive a full term in office. It could be worse: as Deutsche Welle noted earlier, the CSU collapse could lead to Seehofer's resignation from Merkel's government, and conceivably the exit of Markus Söder, Bavaria's prime minister from the Bavarian state premiership, which would remove two of the chancellor's most outspoken critics from power, and give her room to govern in the calmer, crisis-free manner she is accustomed to. Furthermore, the heavy loss and potentially big resignations in the CSU might push a desperate party in a more volatile, abrasive direction at the national level. That would further antagonize the SPD, the center-left junior partners in Merkel's coalition, themselves desperate for a new direction and already impatient with Seehofer's destabilizing antics, and precipitate a break-up of the age-old CDU/CSU alliance, and therefore a break-up of Merkel's grand coalition. In short: Anything could happen after Sunday, up to and including Merkel's fall.